The annual event tests the limits of bicycles as an emergency response tool. Bicycles — especially durable ones that can carry lots of stuff — will be one of the most important tools we have when a disaster strikes. They don’t need fuel, they can be carried over obstacles, they can haul lots of medical supplies and food, and they can even be used to generate electricity if necessary. 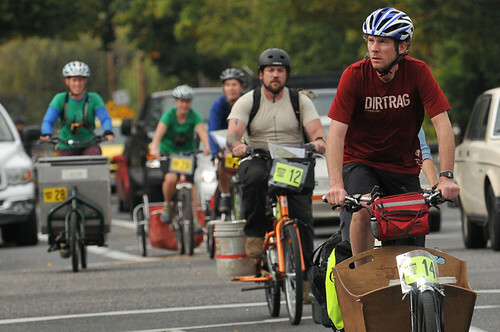 Competitor Adam Newman leads a group of riders on North Rosa Parks Way en route to the Oregon Food Bank checkpoint where they had to pick up a box of food before returning to the University of Portland. Participants negotiate a water-carrying checkpoint at last year’s event. Competitors Ryan Hashagen (R) and Michael Jones work together to lift a loaded cargo bike over one of the many obstacles on the course. Those aren’t the words you expect to hear during a competitive cycling event. 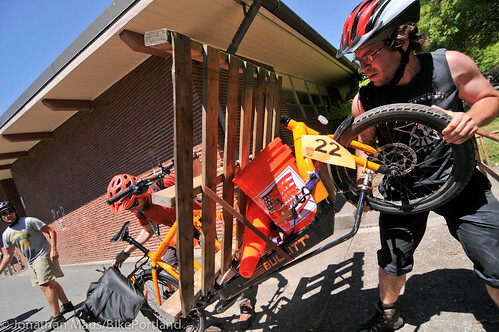 But when the event — the third annual Disaster Relief Trials — is based around a mock disaster and the competitors are piloting 150 pounds or more of bike and cargo on a challenging, 35-mile course, teamwork takes priority over individual gain. 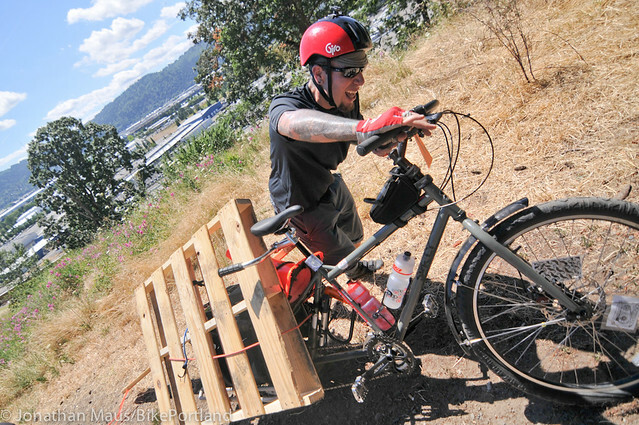 Two major trends in cargo biking will come together in Portland on Saturday at the Oregon Museum of Science and Industry. 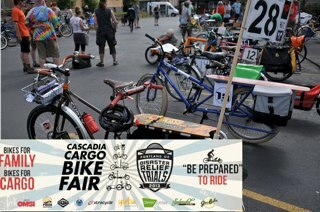 Organizers of the Disaster Relief Trials and the Fiets of Parenthood have joined forces this year in what is sure to the largest cargo bike gathering of the year. 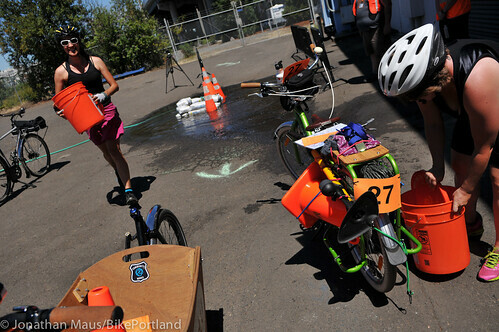 Portland’s 30-mile catastrophe-themed urban bike competition returned for a second year Saturday with a splash and a lot of grunts. It’s here! The biggest event of its kind in the world. 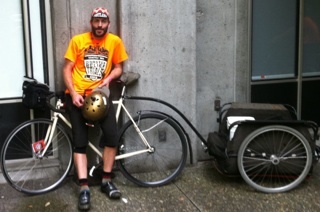 One of the most interesting and influential bike events in Portland starts with a kickoff party tonight. 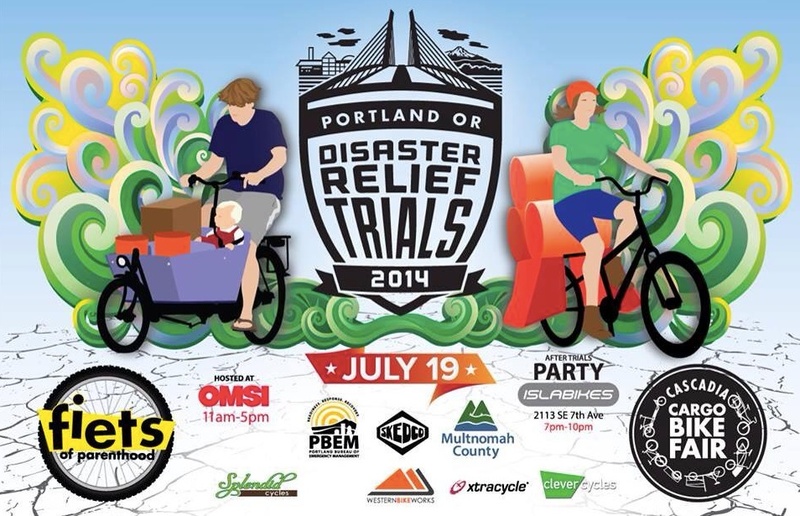 The Disaster Relief Trials was first held last year at Velo Cult Bike Shop in Hollywood and since then the event has ridden a wave of interest, gotten attention from local, regional, and even national agencies, and has spawned imitators in Vancouver (BC), Seattle, Eugene, and other cities. 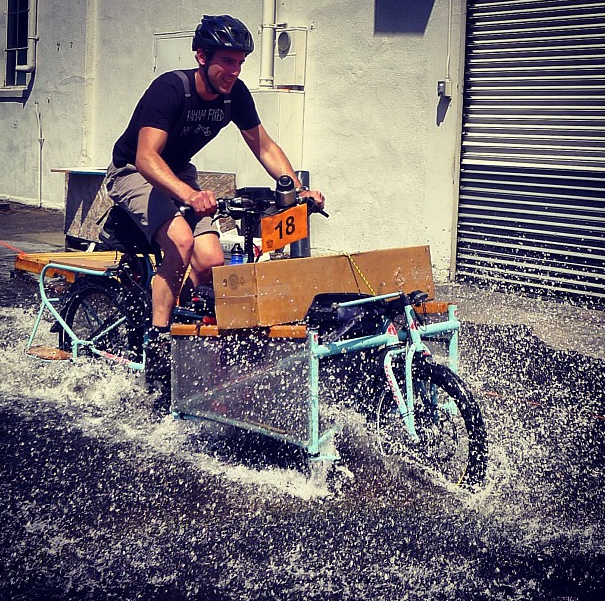 Cargo bikes to the rescue! 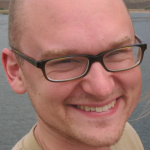 The City of Tigard is planning a major, region-wide “mock emergency” exercise on Thursday and they want to include cargo bikes. 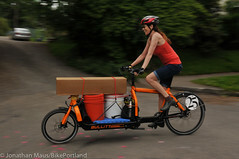 Tara Harper, a consultant working on the event, was inspired by her involvement with the Disaster Relief Trials in Portland last summer and says cargo bikes would be uniquely suited to the task. The exercise is based on a bioterrorism attack that creates a massive public health emergency. The entire population will be at risk unless they receive medicine that’s doled out at a “Point of Dispensing station”. Tigard will test the POD station concept for the first time on Thursday and officials from many other regional jurisdictions will be on hand to observe it. The medicine would be flown in from other areas and the challenge is to get the boxes of treatments and supplies to the POD stations as fast as possible. With traffic jams and other unforeseen circumstances, vehicles are needed that can operate regardless of traffic conditions.